Answer: You are correct that the Moon’s gravity causes tides in large bodies of water — but not only when it’s Full. There is always a tide “under the Moon” whatever the lunar phase. The Sun has a similar (but smaller) tidal effect, so there’s also always a tide “under the Sun.” When the Moon is Full (or New) its gravitational pull is aligned with that of the Sun, and this causes a larger tide than usual. Your supposition about the Moon affecting things other than water is also correct, but the effect is harder to notice. This is the source of the force that causes tidal distortion. The total gravitational force between the Earth and Moon can be calculated as 1.982×1020 N (from Newton’s law of gravitation). 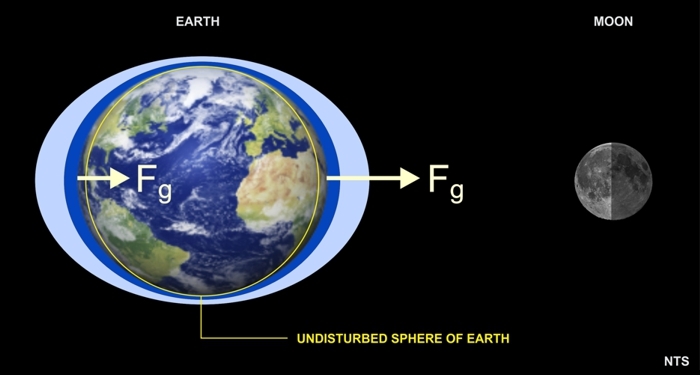 So pulling on one side of the Earth 6.8% harder than on the other side is equivalent to “stretching” the Earth with a force of 1.3×1019 N (about 1.4×1015 tons). Note that the Moon raises two tidal bulges on Earth. The bulge on the side of Earth opposite the Moon may at first seem contradictory, despite the preceding calculation. Think of it this way: If you pull a bucket of water toward you, the water will momentarily slosh up on the side away from you. Earth is like the bucket, but it’s being pulled by the Moon. The water that forms a tide flows in from other places around the Earth — it’s not “lifted upward” from the ocean floor. Now we can answer your question. Because of this force differential, the atmosphere also gets “pulled up” by the Moon. But since it lacks a definite top edge (like the ocean) it’s difficult to measure any height change. Rather, the Moon’s effect shows up as a slight decrease in atmospheric pressure on the order of 1-2 millibars. The solid crust of the Earth is also “pulled up” by the Moon. Parts of Earth’s crust are stiffer than others, but on average there’s a 25 cm upward distortion caused by the Moon’s gravity. This has been measured by sensitive GPS arrays. As for other objects (like people) there is an effect, but if you calculate the gravitational differential between your head and your feet it works out to a mere 3.5×10-13 N (about the weight of a grain of sand). This is because the term (DFAR / DNEAR)2 is very close to unity. The difference in distance to the Moon from your head and feet is only about 2 meters out of 3.84×108 meters. So you are stretched slightly taller and weigh slightly less when the Moon is overhead, but only by an infinitesimal amount.